The subgenus Gyrodromella Michener is confined to the Palaearctic region. It contains 8 described species (Müller, 2015b). Sleeping male of Chelostoma (Gyrodromella) rapunculi (Lepeletier, 1841). Foto A. Müller. 2015 Chelostoma (Gyrodromella) clypeale Müller, Zootaxa, 3936: 410-411. Type material: Holotype f, “30km W of Gaziantep” [Turkey], ETHZ (Zurich); paratypes mm, ff. Flower preferences: Probably oligolectic on Campanula (Campanulaceae) and possibly also closely related genera (Müller, 2015b). 1890 Chelostoma orientale Schletterer, Entomologische Nachrichten (Berlin), 16: 236. Type material: Holotype f, “Araxes-Thal” [Armenia], NMW (Wien).-Combination Heriades orientalis (Schletterer) in Friese (1911b: 23). 1798 Apis fuliginosa Panzer, Faunae Insectorum Germanicae, 56: 16. NOMEN PRAEOCCUPATUM [not Apis fuliginosa Scopoli, 1770; not Apis fuliginosa Christ, 1791]. 1841 Heriades rapunculi Lepeletier, Histoire Naturelle des Insectes, vol. 2, p. 406 [not seen]. Type material: f(f), [France]. 1848 Heriades nigricornis Nylander, Notiser ur Sällskapets pro Fauna et Flora Fennica Förhandlingar, vol. 1, p. 269. Type material: Syntypes m(m), f(f), “in Fennia” [Finland]. Type species of Gyrodromella Michener.-Synonymy in Benoist (1928d: 107). 1852 Chelostoma inerme Eversmann, Bulletin de la Société Impériale des Naturalistes de Moscou, 25, 74. Type material: Syntypes m(m), f(f), “in promont. Uralensib., in provinciis Orenburgensi et Simbirscensi” [Russia], ZIN (St. Petersburg).-Synonymy in Schwarz et al. (1996: 116). 1872 Heriades casularum Chevrier, Mittheilungen der Schweizerischen Entomologischen Gesellschaft, 3: 505. Type material: Syntypes ff, “Environs de Nyon” [Switzerland], MHNG (Genève) or NHMB (Basel).-Synonymy with Heriades nigricornis Nylander in Schletterer (1889: 641). 1889 Chelostoma proximum Schletterer, Zoologisches Jahrbuch für Systematik, 4: 643. Type material: Holotype m, “Transkaukasien (Kussari)” [Azerbaijan], NMW (Wien).-Combination Heriades proximus (Schletterer) in Dalla Torre (1896: 379). 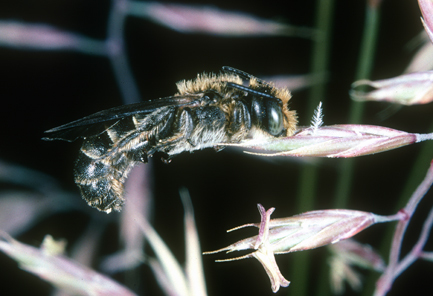 Combination Chelostoma (Chelostoma) proximum Schletterer in Wu (2006: 83). Synonymy in Müller (2015b). 1928 Osmia (Acanthosmia) archanensis Cockerell, The Annals and Magazine of Natural History (London), ser. 10, 1: 353. Type material: Holotype f, “Archan” [Russia], BMNH (London).-Synonymy with Chelostoma fuliginosum (Panzer) in Tkalcu (1967: 94). 1928 Osmia (Acanthosmia) platyodonta Cockerell, The Annals and Magazine of Natural History (London), ser. 10, 1: 352. Type material: Holotype m, “Irkutsk” [Russia], BMNH (London).-Synonymy with Chelostoma fuliginosum (Panzer) in Tkalcu (1967: 94). 1934 Heriades confusa Benoist, Bulletin de la Société Entomologique de France, 39: 158. Type material: Lectotype m, by designation of G. van der Zanden (Müller, 2015b), “Environ d’Alger” [Algeria], MNHM (Paris).-Synonymy in Müller (2015b). Distribution-Europe: A, AND, AZ, B, BG, BY, CH, CZ, D, DK, E, F, FIN, FL, GE, GR, H, HR, I, I(Si), L, LT, LV, MK, NL, P, PL, RO, RUS, S, SCG, SK, SLO, UA. Northern Africa: DZ, MA. Northern Asia: KS, KZ, MGL, RC, RUS(FS), RUS(WS), TM, UZ. Southwestern Asia: IL, JOR, IR, SYR, TR. Extralimital: Nearctic (Canada, USA) [Introduced]. Identification-Keys, Descriptions: Amiet et al. (2004); Banaszak and Romasenko (2001); Benoist (1929a); Eickwort (1980: 318); Friese (1898); Medvedeva (1978); Müller (2015b); Romankova (1995); Scheuchl (1996); Schletterer (1889); Torres et al. (2012); Wu (2006). Flower Preferences: Oligolectic on Campanula (Campanulaceae) and possibly also closely related genera (Müller, 2015b). 2015 Chelostoma (Gyrodromella) tonsum Müller, Zootaxa, 3936: 414-415. Type material: Holotype m, “Kuyucak” [Turkey], ETHZ (Zurich); paratypes mm, ff. 2012 Chelostoma (Gyrodromella) aegaeicum Müller, Zootaxa, 3355: 36. Type material: Holotype m, “Lesvos, 3.8km SSE of Agiasos, 760m” [Greece], ETHZ (Zurich); paratypes mm, ff. Distribution-Europe: GR(Cr, Ikaria, Lesvos, Samos). Southwestern Asia: TR. Flower preferences: Oligolectic on Campanula (Campanulaceae) and closely related genera such as Legousia (Müller, 2012, 2015b). The main pollen hosts on Lesvos are Campanula lyrata, C. delicatula and Legousia pentagonia (J. Devalez, personal communication). 1889 Chelostoma handlirschi Schletterer, Zoologisches Jahrbuch für Systematik, 4: 624. Type material: Lectotype m by designation of Müller (2015b: 416), “Mehadia” [Romania], ETHZ (Zurich).-Combination Heriades handlirschi (Schletterer) in Dalla Torre and Friese (1895: 69). Distribution-Europe: BG, MK?, RO. Southwestern Asia: TR? Identification-Keys, Descriptions: Friese (1898); Müller (2015b). 1935 Heriades hebraea Benoist, Bulletin de la Société Entomologique de France, 40: 280. Type material: Holotype m, “Palestine: Jérusalem” [Israel], MNHN (Paris).-Synonymy with Chelostoma handlirschi Schletterer in Schwarz et al. (1996), rejected by Müller (2015b). Distribution-Southwestern Asia: IL, JOR, TR. Identification-Keys, Descriptions: Müller (2012, 2015b). 1895 Chelostoma nasutum Pérez, Espèces nouvelles de mellifères de Barbarie, p. 20. Type material: Lectotype f, by designation of G. van der Zanden (Müller, 2015b), “Ze’niet” [Algeria], MNHN (Paris); paralectotype m.-Combination Chelostoma (Chelostoma) nasutum Pérez in Michener (2000: 40). 1897 Eriades truncatus Friese, Entomologische Nachrichten (Berlin), 23: 193. Type material: Lectotype m, by designation of G. van der Zanden (Müller, 2015b), “Algier” [Algeria], ZMHB (Berlin).-Synonymy in Benoist (1928d: 108). Distribution-Europe: BG, E, F, GR, RO. Northern Africa: DZ. Southwestern Asia: TR. Identification-Keys, Descriptions: Friese (1898); Müller (2015b); Torres et al. (2012). Flower Preferences: Oligolectic on Campanula (Campanulaceae) and possibly also closely related genera (Sedivy et al., 2008; Ebmer, 2009; Müller, 2015b). Flower records: Campanula topaliana (Ebmer, 2009).